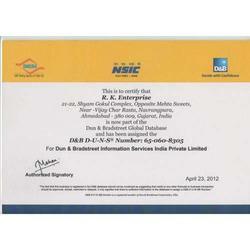 "R. K. Enterprise" is certified by D&B and established in the year 1990. 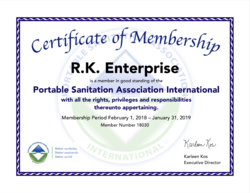 We are the manufacturer of Portable Toilets, Chemical Toilets, Toilet Vans, Mobile Urinal Unit, and much more. Apart from this we also providing Rental Service to Our valuable client's. 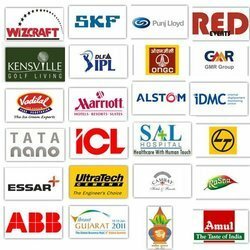 These products are made as per the specifications provided by our clients. They are known for their silent features like stability, accurate dimensions, and long service life. These are user-friendly products and offers durability and efficiency. Our products are developed by using the latest technologies. We manufacture our products with high-grade quality materials and examined for their efficiency, accurate dimensions, and consistency. Our mentor of the company, " Mr Pawan Kapoor", has huge industry experience and excellent management skills that helped us to get name and fame in the market. He is having lots of knowledge in this field for the customers. Dun Bradstreet Information Services India Private Limited. We have a huge spaced manufacturing unit of 12,000 Square Feet for developing our products. These products are made using best quality materials and known for their reliability and efficiency. Our products are formulated as per the needs of the clients. This unit is widely spread with a huge area in such a way that they meet the requirements of the customers. Our products are made as per international quality standards. We have well qualified and experienced experts to take care of this company. We keep on upgrading this company on a regular basis and meet the bulk demand of our customers within a specified time frame.